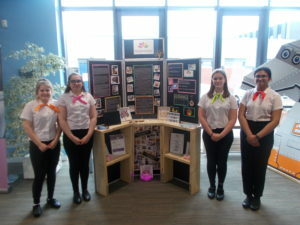 The year 10 Young Enterprise team, Personalitree took part in the Lancashire Final of the Company Programme at UCLAN this week. They competed against a number of other schools and youth groups where they presented their account of their year in business to a panel of judges. The team also submitted a report on their company as well as being interviewed at their trade stand. Personalitree were awarded the trophy for best business plan.